I recently installed Magento, an Open Source eCommerce Shopping Cart that dominates most of the shopping cart market. The cart is template driven and can be made to look like anything you can dream of….with a bit of work! When installed, the software installs a Demo shopping cart that is fully functional but needs a lot of work to get it to look like the site you want your customers to see. While I was working on the template I noticed the “About Us” link says “about-magento-demo-store”, I spent a bit of time trying to work out why the “About Us” link in the footer said “about-magento-demo-store”, clearly for a live site this was not a good look for a link. A scan through all the files revealed no mention of the link so it had to be derived from the MySQL database , a look through the install package showed an insert of the “About Us” string into a database table… suspicion confirmed! Some hunting revealed that the footer is partially assembled from a Static Block called surprisingly “Footer Links”, this can be found under the “CMS” tag. 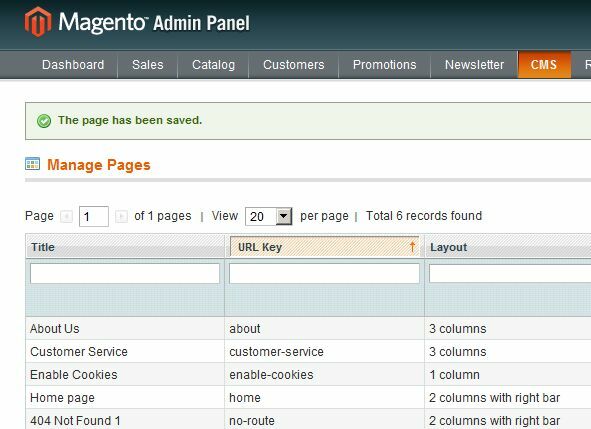 When you enter the CMS and select “Pages” you see the following list, the “About Us” entry is just the mark up, but it has the reference name “about-magento-demo-store” so you need to change this first. The CMS tag and the pages under it. 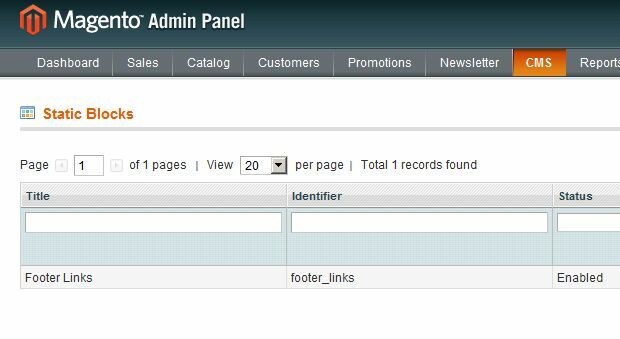 Edit the “Footer Links” block and you will see the markup that makes up the Footer… each is a hyper link to the content. If you select the “About Us” link, you can edit it and change the link to “about” or what ever you renamed the “about-magento-demo-store” entry above. You can also add references to other pages here as well so keep that in mind. Once saved, the new hyper link takes effect and hovering over the “About Us” footer link should show the new (renamed) page. Don’t forget that the content is for the Demo site!